We had just three days in Paris and we arrived in the rain, but we didn’t care. 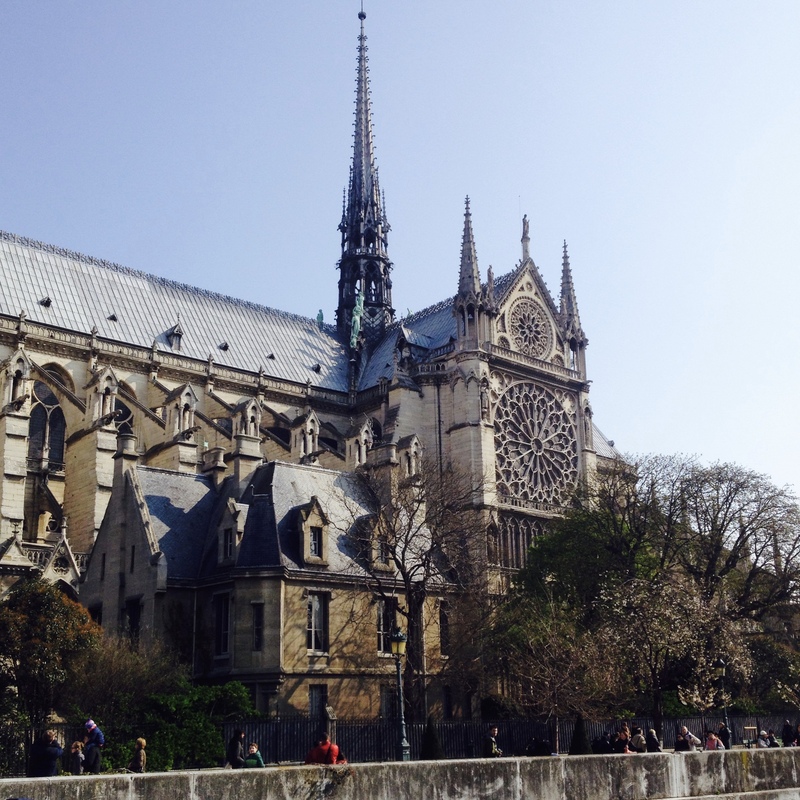 After all, there were galleries, cafes, and gothic cathedrals to visit. We decided to walk everywhere. 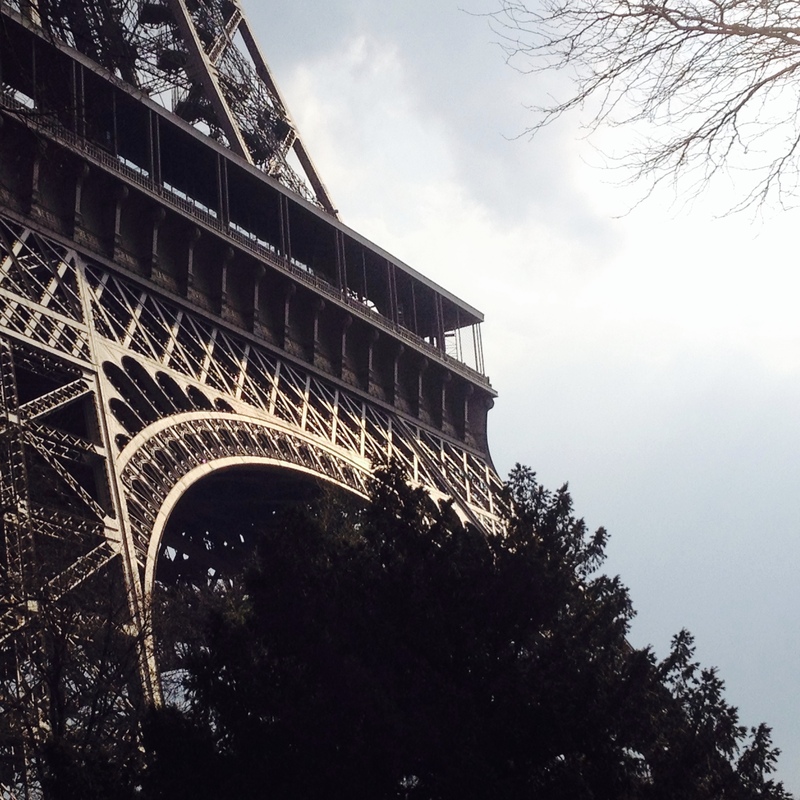 We may have seen fewer tourist highlights this way, but we saw so much more of Paris. I shivered nearly the whole time, having utterly missed the mark for what March in Europe would be like that year. I seriously underestimated how cool the spring would be when packing, but it was so hard to imagine anything but the snowbound prairies that surrounded me and I went too far the other direction. Even the sunny moments had a sharp bite to them that put a hustle in our step. 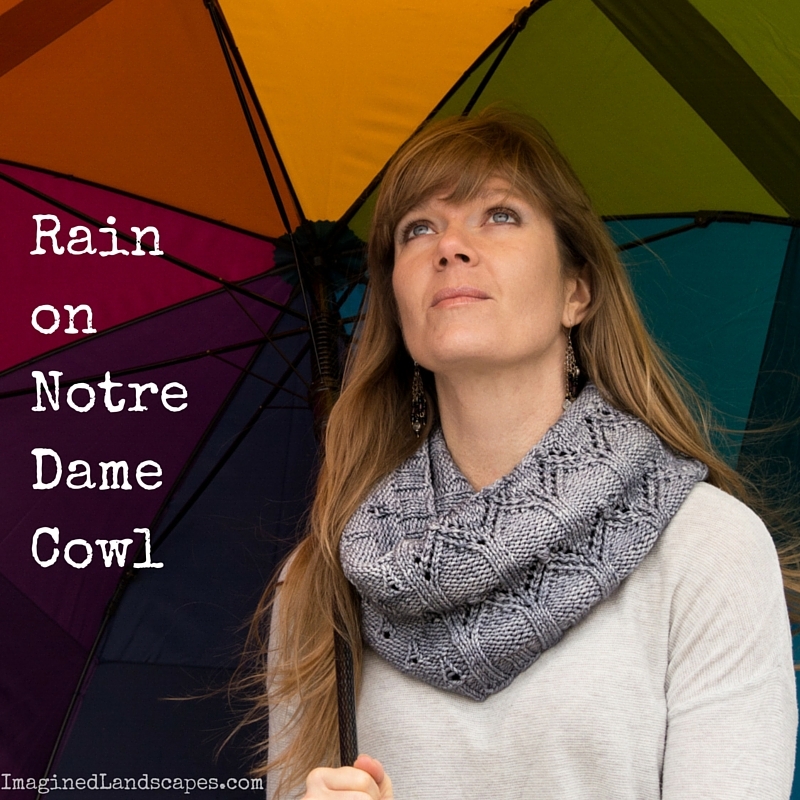 This cowl is designed to evoke my memories of that incredible visit: the intricate gothic architecture and the rain, that feeling of silvery skies and sharp spring winds. 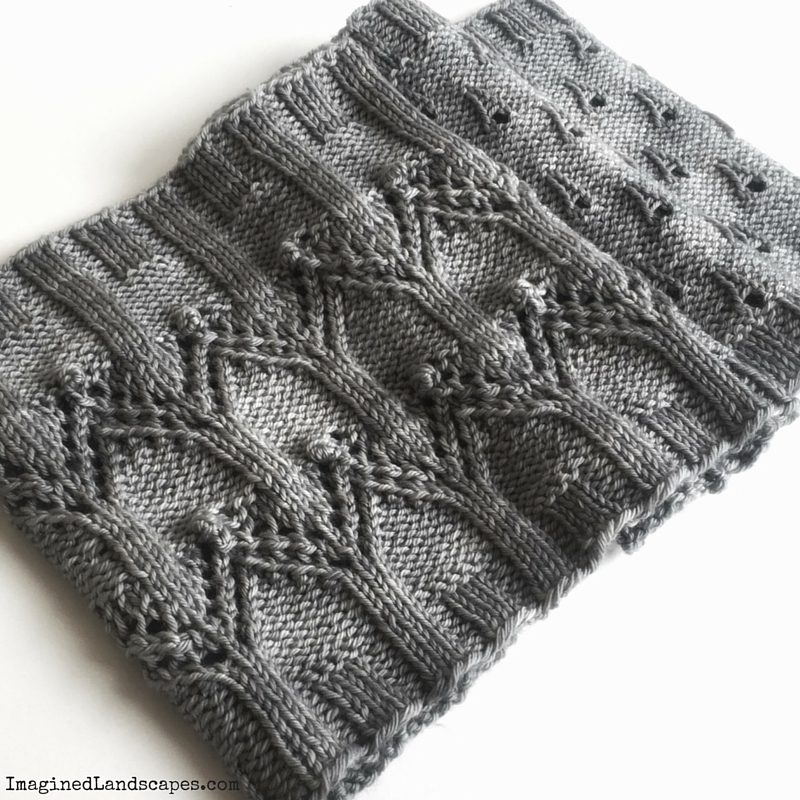 You’ll be warm and stylish in this bold lace cowl – the way I wish I’d felt! 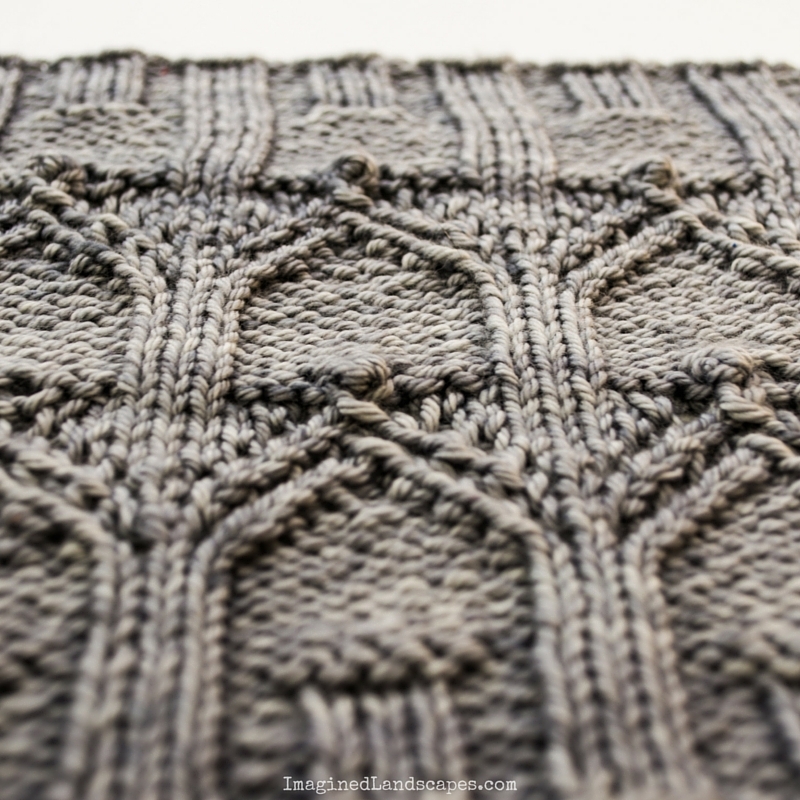 Knit in a worsted weight yarn, you’ll find the stitch patterns bold and satisfying to work up. There are directions for a smaller neck warmer that you can tuck under a jacket without bulk as well as a double loop cowl. Both are knit in the round from the bottom up. Whether you like charts or written instructions, this pattern has you covered. The last page even contains a handy checklist to help you keep track of which round you are working for each of the two stitch patterns. My first lace design and certainly not my last! I really love the bold look of these two stitch patterns. I found them quite intuitive to work – they lead the knitter forward in a nice, logical fashion. 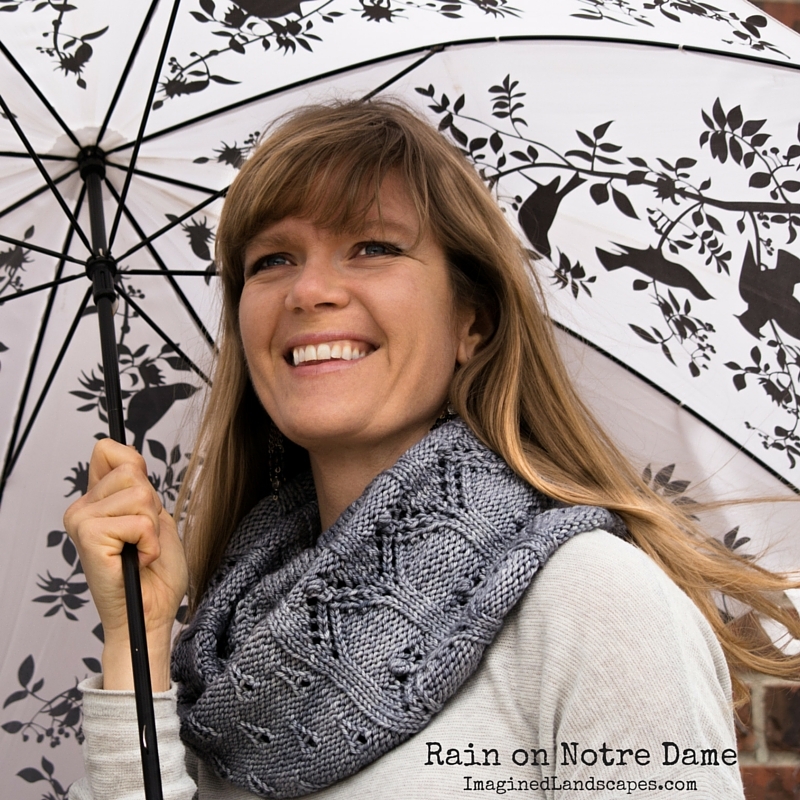 The one pattern is known as Droplet Lace or Eiffel Tower, both of which are perfect for this cowl’s inspiration. The rain is an incredibly simple pattern to work – I didn’t even use stitch markers because once I had the first row of yarn overs in place for each droplet it was utterly obvious where the following stitches lined up. Here’s a closeup of the tiny, tidy bobbles that cap off the archways of the Cloisters pattern. I’m not usually a fan of bobbles, but these little ones really serve more as punctuation marks. Several of my testers who are tighter knitters found that they had an easier time working the bobbles with the help of a crochet hook – something to think about. As always, this pattern has been test knit. Hi: I tried to order and an error was posted. Is it the pattern plus the wool kit? Sorry about that, Gayle. You got lost in the spam comments. I’ve fixed the buy it now button links so that they work. But you’ll have missed the sale price, so I’m going to email you a coupon code that you can use. I don’t do kits yet, so it’s just for the pattern.